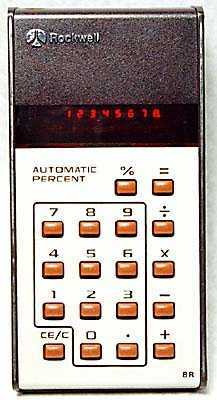 Distinctive features: A popular, low-cost, calculator from the Rockwell range. Integrated circuit - Rockwell B5000. 62 x 92 x 22 mm (2.4" x 3.6" x 0.9"). Made in U.S.A., Mexico, Hong Kong. 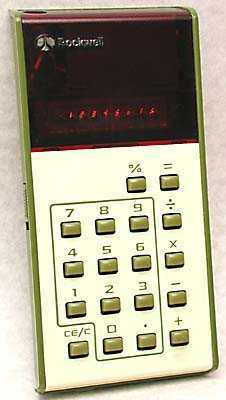 Versions were produced with different case styles for other companies. All have the characteristic domed keys. Inside the Rockwell 8R, showing the small number of components. 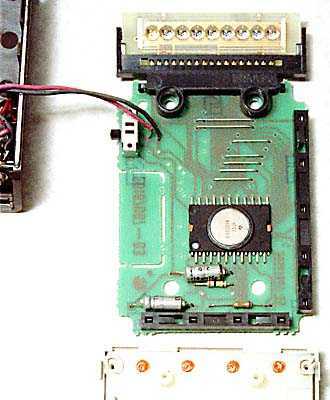 In early versions the keyboard plugs into the circuit board using the black sockets on the right and bottom edges. However these are expensive so in later versions the keyboard is soldered to the circuit board. This version was made for sale in True Value hardware stores in the U.S.A. 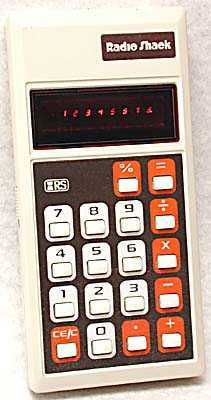 This version was made for sale through Radio Shack electronics stores and catalogues in the U.S.A. This version was made for sale in House of Fraser department stores in the U.K., with its stag's head logo. House of Fraser also had other Rockwell models re-badged for them but retaining the Rockwell case. Click on the picture to go to the House of Fraser page.